State environmental regulators are failing to stop Florida Power and Light from endangering Miami-Dade County’s primary source of drinking water, according to an administrative law judge order issued this week. Salt water from the cooling system at the Turkey Point nuclear power plant has spread underground more than five miles west of the plant, reducing the amount of freshwater in the Biscayne Aquifer for drinking and irrigation, according to the judge and a University of Miami study forwarded this week to the Miami-Dade County Commission. The state Department of Environmental Protection claimed it was unable to attribute the pollution to specific FPL violations of groundwater or water quality standards. 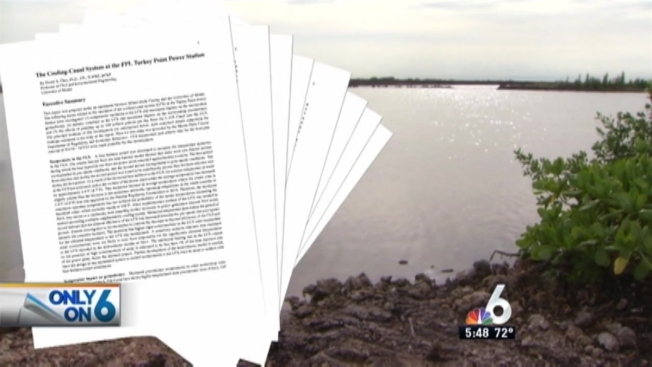 But the administrative judge rejected DEP’s see-no-evil approach, claiming it "cannot be reconciled with the undisputed evidence" the FPL’s cooling system is the major contributing cause to saltwater intrusion. Florida rules prohibit discharges from the plant that “impair the reasonable and beneficial use of adjacent waters” and FPL’s dumping of water with high salt content is doing just that, the judge ruled, noting how DEP could have responded more forcefully to the politically powerful corporate polluter. FPL contributed more than $7.5 million to state candidates, political parties and committees between the 2004 and 2012 election cycles and spent another $4.7 million lobbying between 2007 and 2013, according to Integrity Florida, nonpartisan research institute. The head of DEP is appointed by Gov. Rick Scott; a former head of DEP is now a FPL vice president in charge of dealing with governmental affairs. A DEP spokesperson has not returned a call seeking comment. An FPL spokeswoman said the Integrity Florida political contribution data is inaccurate, misleading and not credible. As for its efforts regarding salt migrating into surrounding waters, the FPL spokeswoman noted the utility is working with Miami-Dade County to monitor and address “high chloride concentrations” near the canal system. "This is not new. We know we have a salinity issue. This issue has slowly developed over 45 years of system operation, and will take considerable time to fully address. However, FPL is committed to doing its part to address its contribution to the buildup of chlorides in the surficial aquifer. We anticipate being able to continue to demonstrate significant progress." DEP went so easy on FPL, the judge’s order noted, the agreement they reached calling on FPL to better monitor its pollution "lacks the most fundamental element of an enforcement action: charges." The agreement (called an administrative order or AO) was challenged by the City of Miami and a mining company, which claimed it would lose its mining privileges on land west of the plant if saltwater concentrations caused by the FPL cooling system continue to increase. The AO also fails to pass legal muster, the judge found, because it does not require FPL “to come into compliance with standards” or set a deadline for it to do so. The judge, whose recommended order can be appealed, is calling on DEP to rescind its current agreement with FPL or amend it so that it enforces the existing environmental laws. Miami-Dade County Commission found FPL greatly underestimated how much heat the upgrades of two nuclear power generators at the Turkey Point power station would add to its cooling system. Since hotter water temperatures lead to more evaporation of freshwater, salinity in the remaining cooling system water also increases, exacerbating the problem of saltwater intrusion into the aquifer, the study noted. The water temperature problem will likely increase chances FPL will have to reduce the amount of electricity generated there in the future, according to the UM study. In the summer of 2014, when water flowing into the plant began approaching the 100-degree maximum then authorized by the Nuclear Regulatory Commission, FPL obtained a waiver from the NRC to increase the maximum to 104 degrees – the highest temperature allowed for any nuclear power plant in the country. But that four-degree increase does not compensate enough for what the study found was an average 4.7-degree increase in average water intake temperatures since FPL increased the capacity of its two nuclear powered generators from 728 megawatts to 1,000 megawatts. In 2008, FPL consultants anticipated the new generators would increase the intake water temperature by only 0.9 degrees; instead, it has increased more than five times that amount , by 4.7 degrees, the UM study found. But, late Friday, FPL said “Dr. Chin’s study is misinformed. The 4.7 degrees discussed by Dr. Chin is an observation that we can’t validate, but in any event is not comparable to the 0.9 degree prediction.” There are other factors included in the higher value. To cool water used in the plant, FPL has a 5-mile long, 2-mile wide system of canals that, from the air, resembles a radiator. Industrial waste water usually of about 108 degrees flows south from the plant’s water discharge and, over two days, cools to typically 93 degrees, before arriving back at the plant’s water intake area. When the intake temperatures spiked near the then-maximum allowable 100 degrees in 2014, FPL persuaded the NRC to give it the four-degree increase. And intake temperatures did spike at 102 degrees that summer, FPL says. To further lower water temperatures, FPL also got an emergency order from the South Florida Water Management District in August 2014 to pump up to 100 million gallons a day of freshwater from a nearby canal into the cooling canal system, or CCS. The emergency pumping coincided with a a 6.5-degree drop in water temperature. In 2015, FPL says it pumped on average 30 million gallons of water a day from late August through November, and the maximum intake water temperature reached 98.5 degrees. But the UM report warns that pumping from the canal is likely to cause "adverse impacts" unless the pumping protocol is changed. Among the adverse impacts contemplated: increasing the salinity of the canal water, which also flows into Biscayne Bay. Chin’s study says if FPL pumps 100 million gallons a day from the canal into the cooling canals – as is allowed – it’s possible a “saline circulation cell” would develop, moving saltwater from the cooling canal, through the aquifer and back into the freshwater canal. That would degrade the water in the canal, which provides freshwater to Biscayne Bay. The salinity of groundwater for miles around the plant has already increased because of the CCS. The administrative judge found Turkey Point’s CCS is the major contributor to the salinity of water in the Biscayne Aquifer in an area extending nearly five miles west and more than two miles east of the cooling canals. A 5-mile long interceptor ditch designed to keep saltwater from migrating west toward Everglades National Park is not doing its job, the UM study and judge found. After considering public comment on the UM study over the next 30 days, Dr. Chin will have 60 days to submit a final report to the county commission. The administrative law judge’s recommended order does not direct FPL to do anything. It recommends actions by FDEP. As we always have, we will comply with all lawful orders, regulations and permit requirements. Despite several legal and regulatory delays, FPL continues to take action and improve canal conditions at Turkey Point. These actions have been well documented and observed by the county and other government officials. FPL’s actions have been successful by reducing salinity levels in the Cooling Canal System, significantly improving water quality and stabilizing operations at the site. In October 2015, FPL entered into a Consent Agreement with Miami Dade County that identifies additional actions FPL will undertake to address high chloride concentrations in the groundwater near the CCS. As for the recent Recommended Order, the Judge recommended to the Florida Department of Environmental Protection (FDEP) that the order has some deficiencies. We expect FDEP will consider the recommendations, and move forward in the near future. Again, FPL will continue to comply with all regulatory requirements. Dr. Chin’s report was conducted without any interaction with FPL engineers or Plant Operators, and he did not engage FPL in any way. This report does not include recent data that we believe would have significant impact on Dr. Chin’s conclusions. FPL has always participated with regulatory agencies, when asked. It would have been a more complete report had we had the opportunity to provide input to Dr. Chin’s review, but again we were not contacted by him. With regard to pumping water from L31, Dr. Chin assumes that FPL would be pumping 100 mgd every day. He does not understand that the constraints included in the permit limit FPL to a daily average value of approximately 30 mgd, when FPL was allowed to pump. Also, the L-31E water is pumped into the CCS, and there – as it mixes with the CCS water – is the only location where you might say L-31E water increases in salinity – as it reduces the salinity of the CCS. No salinity is added to L-31E water in the canal, and no salinity is released to Biscayne Bay. Water released to BB from the L-31 never comes in contact with CCS water. Integrity Florida (is) a group known for disseminating an anti-utility “study” funded by an anti-utility lobbying group (SACE). This study is inaccurate, rife with errors and misleading claims and is not viewed as credible for that reason.